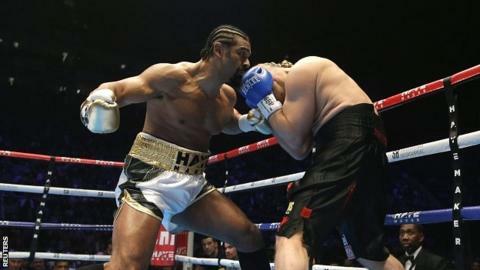 "It's been a tough road but I'm finally back," said Haye, who now has 27 wins from 29 professional fights. "I felt so cool and calm in there. I don't believe any heavyweight out there could have taken those punches. "The shoulder feels better than it was before. I feel this new and improved version of me will go on and win heavyweight championships." Fury has vowed he will never defend his titles against Haye after the Londoner pulled out of two scheduled bouts against him in 2013. "I think Tyson Fury is a good fighter, very good," said Haye. "It's a shame he doesn't want to fight me. I think we all know why, when he sees punch power like that." "I want to get back in the ring as soon as possible, keep testing myself and work up the rankings to get a title fight." Fury watched Deontay Wilder retain the WBC heavyweight title in New York on Saturday - then traded insults with the American in the ring. Another potential future opponent for Haye is fellow Londoner Anthony Joshua. "I think a fight between me and Anthony Joshua will be way bigger [than a fight against Fury]," said Haye. "I believe that's a fight that could be made later in the year." However, Joshua's team are unlikely to risk their man against a boxer of Haye's pedigree any time soon. A more realistic short-term opponent is Dillian Whyte, who was knocked out by Joshua last month, but gave a surprisingly good account of himself.